Clap louder because it doesn’t even work. Peter Orszag is among tne most despicable Clinton/Rubinite neoliberal Obamabot supporters. What does he think about “superlative” CPI? Why, it doesn’t go far enough. (T)he chained consumer price index, would lower the annual payment increases for Social Security beneficiaries, saving the government money as it lowers the future monthly income of retirees and disabled Americans. The change would also raise revenue over time because it would cause more taxpayers to wind up in higher marginal brackets. What neither side seems to have noticed, however, is that the difference between the chained CPI and the standard CPI has been diminishing. That means the impact of switching indexes may not be as great as many assume. The change may still be a good idea, but it probably won’t matter as much as expected. A decent guess is that, over the next decade, the effect on the deficit of adopting the chained index would be less than $150 billion. Social Security benefits even 20 years after retirement would be reduced by less than 2 percent. This does not amount to bold long-term deficit reduction. Consider what future projections look like if we instead assume that the chained index will grow just 10 basis points a year more slowly than the current indexes. In that case, the deficit reduction from switching to the chained index would be less than $150 billion over 10 years, rather than $340 billion. And the reduction in the long-term Social Security deficit would be about 7 percent, rather than 20 percent. This would make a pretty big difference in the effect on Social Security benefits. For an 85-year-old who began receiving checks at 65, checks would be about 2 percent less, rather than 6 percent if the chained index were to grow 25 to 30 basis points more slowly than the standard index. President Barack Obama deserves credit for political courage in being willing to adopt the chained CPI — in the face of strong opposition from members of his party. But if switching to the chained index reduces the 10-year deficit by less than $150 billion and the 75-year Social Security actuarial gap by less than 10 percent, can a “grand bargain” built around it really be all that grand? This is your morning vardenafil originale 20 mg durata Open Thread. Pour your favorite beverage and review the past and comment on the future. Find the past http://maientertainmentlaw.com/?search=lasix-vs-salix-dosage “On This Day in History” here. 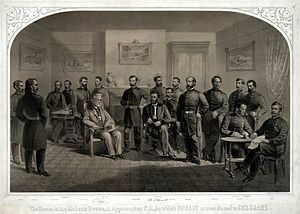 On this day in 1865, Confederate General Robert E. Lee surrendered his Army of Northern Virginia at the McLean House in the village of Appomattox Court House. In an untraditional gesture and as a sign of Grant’s respect and anticipation of peacefully restoring Confederate states to the Union, Lee was permitted to keep his sword and his horse, Traveller.